32 years ago, Volkswagen paired a sporty fuel-injected four-cylinder engine with its Golf hatchback. The combination sparked a revolution and coined the “hot hatch” phrase. 2015 marks the launch of the 7th generation GTI, and it arrives at dealerships with a trophy case of awards. Winning Motor Trend’s Car of the Year and North American Car of the Year awards, plus earning an IIHS Top Safety Pick, three decades of engineering improvements have yielded a car that is lighter and more powerful that its immediate predecessor. 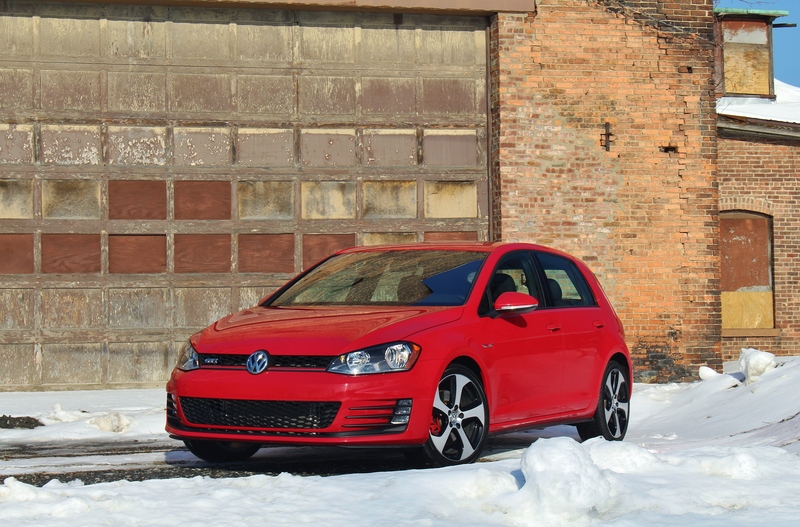 The GTI looked to be a bright spot in the middle of February. Our tester was a four-door model in S trim. That means 18” wheels, heated seats, and a touchscreen infotainment screen are standard. In Tornado Red with classic “Clark” plaid cloth interior, the heritage is clear. In place of the classic manual transmission, the no-cost 6-speed DSG gearbox means this GTI starts at, and stickered for, a reasonable $26,915. Higher trims offer more creature comforts, but a hot hatch doesn’t need a panoramic sunroof, leather seats, navigation, or dual-zone climate control to be entertaining. There was one option, however, that took most of the fun away. Volkswagen’s new MQB platform underpins this new GTI. The hatchback grows 2.1 inches in length and a half-inch in width. Despite the expansion, the Mk7 stands 1.1 inches lower than the Mk6, giving it a more aggressive stance. Additional use of high-strength steel and sophisticated tooling means that the chassis is stiffer and 51 pounds lighter than the previous generation. The new GTI’s body is sharper and more cut than the last two iterations as well. Visually, it looks lighter and longer, thanks to the MQB’s platform requiring the front wheels to sit almost 2 inches further forward. The GTI’s unique wheels, red highlights on the grille and brake calipers, and subtle roof spoiler provide further evidence of 7 generations of heritage. Unfortunately, Bi-Xenon headlights are a $995 option with the Lighting Package, leaving our tester with cheap-looking halogen lights accented by standard LED fog lights. 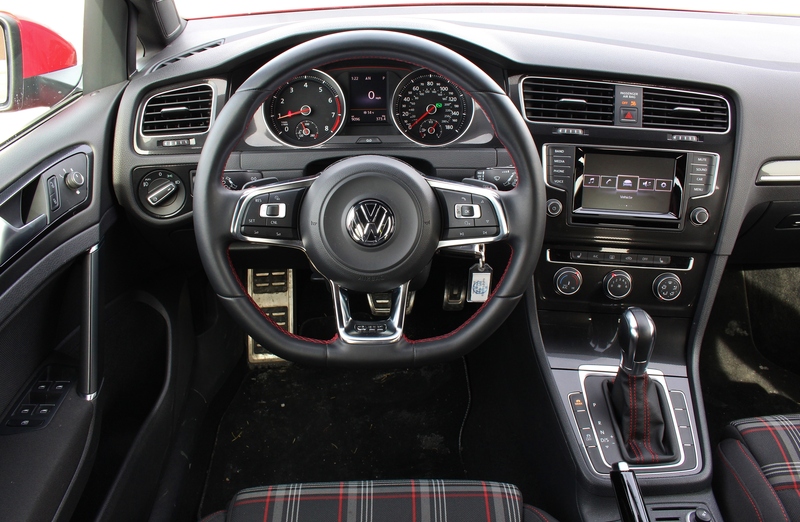 Inside, VW has bestowed the GTI with a classic German interior. The center stack angles toward the driver, presenting a simple column of button, HVAC knobs, and 5.8” touchscreen for easy access. The seats are well bolstered, but don’t feel tight like the Fiesta ST’s optional Recaro seats. There’s plenty of room to sit with a bulky coat, but you won’t slide around. Interior dimensions have grown slightly, meaning that four adults can fit as long as the shorter guests sit in the back. The flat-bottom wheel and GTI-specific gauge cluster present a sporty display for the driver. LED interior lighting and red ambient lighting, unfortunately only in the front seats, give the GTI an up-market feel at night. Up front, the GTI get a new 2.0L turbocharged direct-injection engine that makes 210hp and 258lb-ft torque as standard. Power is regulated to the front wheels with a brake-based stability control system to reduce understeer. For the first time, a $1,495 Performance Package is offered. The package adds a 10hp boost to engine output, larger brakes, and an electronic limited-slip differential to the front axle. Also new, all GTI also gain adjustable driving modes. Steering, throttle, and transmission settings can be toggled between Normal, Sport, and Individual with a button next to the shifter. The traction control system also as an ESC Sport mode that reduces interference during sporty driving. Unfortunately, we didn’t have much opportunity for spirited driving. Our GTI’s 18” wheels came wrapped in Bridgestone Potenza S001 max-performance summer tires. With the exception of one afternoon excursion above freezing, the GTI’s driving characteristics were severely compromised. The sporty summer compound was hard and nearly gripless at the outset of the morning commute. Even as tire temperatures came up, wheelspin could be summoned with an overzealous foot in first or second gear. 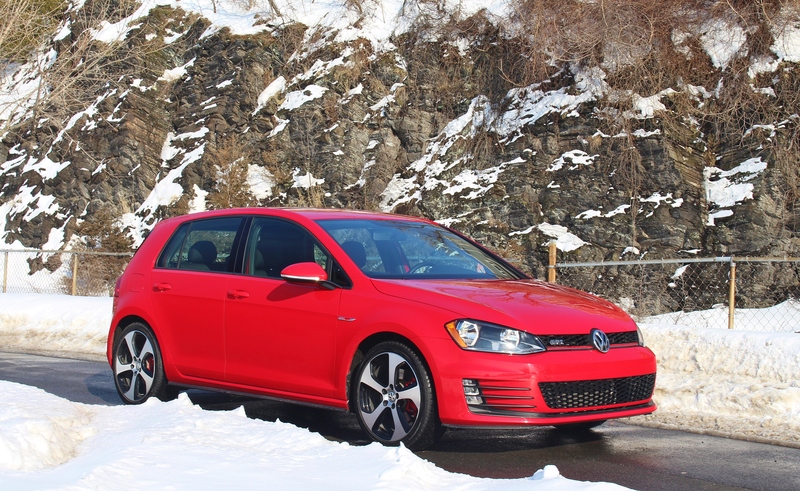 The GTI’s stiff ride was magnified over winter-worn roads, leading to a rare ride quality complaint from one of our passengers. 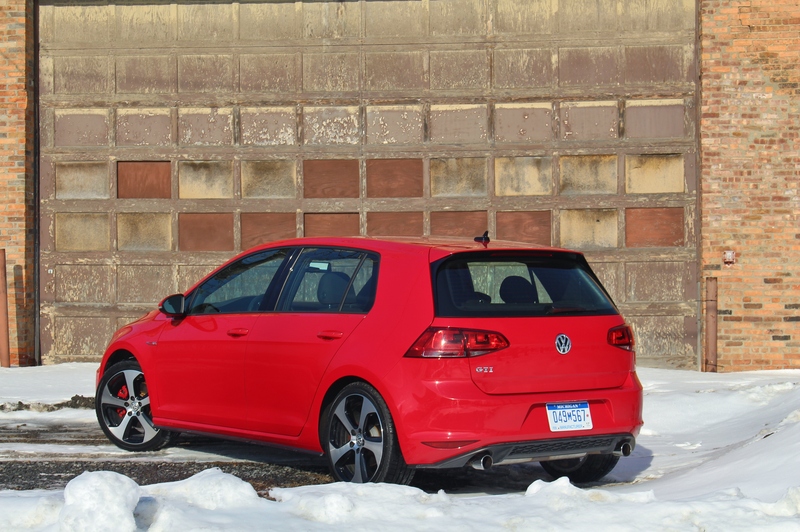 But for one afternoon, one shining moment in a bleak and snowy week, we got a glimpse of the GTI’s true colors. It was one of those drives that concludes with the car ticking satisfyingly as it cools down. Revved out, the 2.0L pulls doggedly with the transmission instantly responding to commands. The steering, the brakes, the balance, everything works together to transform an ordinary hatchback into a back-road barnstormer. 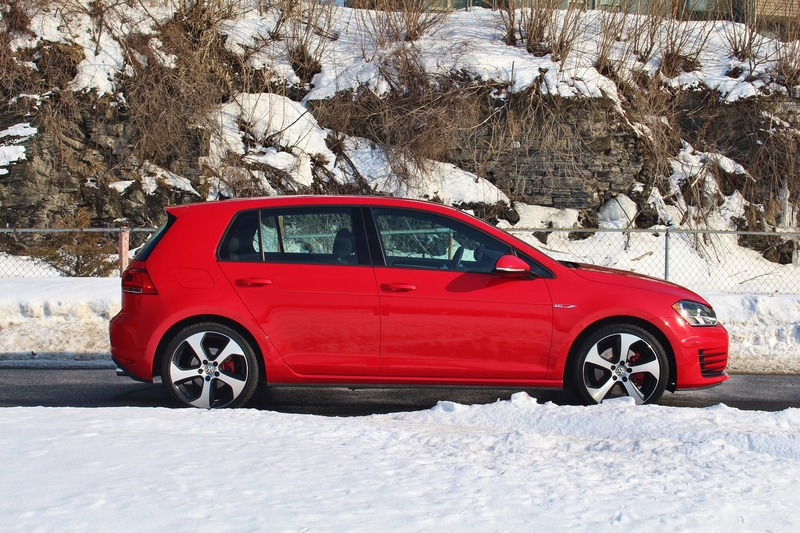 We don’t blame the GTI for its winter-weather performance problems. As we’ve seen from cars as simple as the Mazda 6 to as complex as the Porsche Panamera Turbo, tires can make all the difference. Under better circumstances, we would have more to say. Those in the market for the GTI are willing to forego the more efficient Golf variants, but we averaged 23.3mpg over 400 miles. 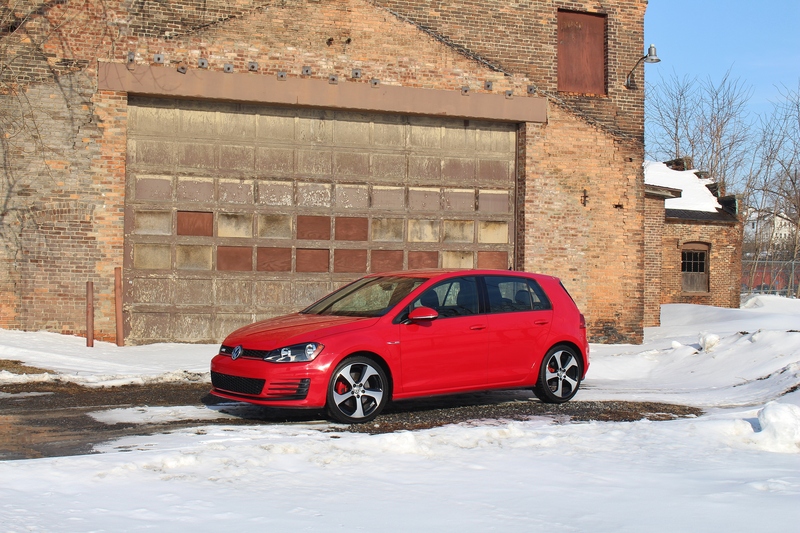 What is clear, no matter the weather, is that the new GTI is practical, well built, and includes a list of features that make it great value for money. For three decades, the GTI has remained true to its roots offering just that, but with a little something extra.